Debut Video Capture Software is a great tool for recording video and is capable of capturing video from different sources. Make your own tutorials, capture video recorded on an external device, record streaming video and more. This video covers making a basic recording with a webcam, recording your screen (capturing either the whole screen or a selection), scheduling recording, viewing your recordings, effects and output options. This video will show you how to make a recording using your webcam. This tutorial video will show you how to record a video of your computer screen. It shows you how to select a portion of your screen, or the entire desktop. It also shows you how to change the mouse pointer recording options, along with a few other tips and tricks. This tutorial will show you how to record your computer screen with a webcam overlay. Learn how to position and size the webcam overlay to meet your needs. This tutorial will show you how to record sound with your video. Learn how to select different audio options for recording your microphone, speakers or mouse clicks. This video will also teach you how to capture audio from other applications. This video will show you how to schedule a recording. Learn how to schedule a single recording or a recurring recording. This tutorial will show you how to add a caption to a video. Learn how to style and position your caption and also how to add a timestamp. This video tutorial will show you how to display your mouse cursor in a screen recording. This tutorial will show you how to apply color and video effects to your video recording. Note: Effects should be applied prior to recording or during recording, they cannot be applied after recording. This video will show you how to add a watermark to your screen recording or video capture. Learn how to change the size and position of your watermark as well as adjust its opacity. This tutorial video will show you the different ways that you can view your recordings and how to navigate the video player. It will also demonstrate how to rename your recordings and share them online. 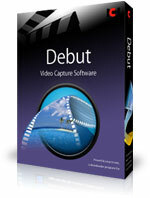 Debut Video Capture Software is designed to be very easy and intuitive to use, giving you the ability to record essentially anything from a webcam, your computer screen, an external video device or online streaming video.